Symbiom ransomware uses sophisticated techniques to infiltrate computers and hide from its victims. Use Reimage to determine whether your system is infected and prevent the loss of your files. Symbiom virus has recently been brought to the spotlight after it was spotted infecting computers disguised as an illegal video game activation software (crack ). In particular, the victims claim to have downloaded a file called OverWatch_Hack.exe hoping to play the OverWatch game for free. Unfortunately, what they are actually dealing with is a variant of the HiddenTear ransomware virus. After opening the malicious file, victims lose access to a large portion of data stored on the computer. The data primarily includes victims personal files such as Office documents, archives, video/audio and image material, etc. Besides, the virus appends all encrypted files appended with .symbiom_ransomware_locked extensions. The worst part of this is cyber infection is that even after Symbiom removal, the data remains encrypted. On the other hand, the cleanup procedure is necessary in case virus victims wants to continue using their devices normally again. Software like Reimage can be used for this purpose. In the Symbiom virus depiction above you can see a ransom note that the virus drops on the computers to demand ransom. Your files have been locked by Symbiom! Don’t worry. I will save your files if you pay. While the 250 dollar ransom may not seem particularly large, given the fact that it gives back the ability to regain access to your data, paying is strongly unrecommended. When dealing with the criminals, there are no guarantees that your files will be restored even when you pay the money. Thus, it is wiser to remove Symbiom from the PC before establishing any contact with the criminals. Symbiom is a software attributable to the category of probably the most serious cyber infections — ransomware. These parasites are especially sneaky when it comes to infiltrating computers. Malware creators think of numerous ways to place the malicious codes on the system. 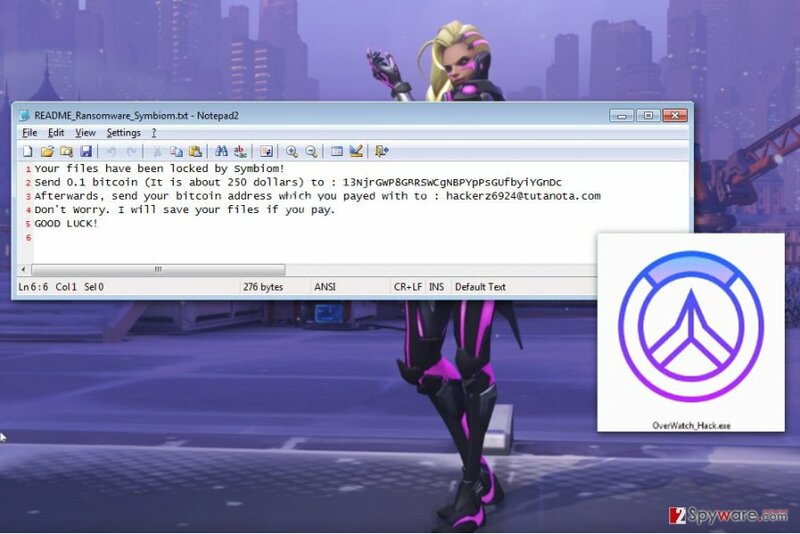 As Symbiom spreads disguised under OverWatch crack file, it is likely that its download links will show up on peer-to-peer networks , gaming forums, and similar sources. Nevertheless, there are other ways the destructive payload can reach computers. For instance, it may be embedded through system or software vulnerabilities detected by exploit kits, fake software updates, compromised online advertisements or spam. So be careful out there! We have already mentioned that Symbiom removal is best performed using security software. Reimage, Malwarebytes MalwarebytesCombo Cleaner or Plumbytes Anti-MalwareMalwarebytes Malwarebytes can be relied upon for this task. The professional security tools will detect and delete the hazardous content from the PC in no time. Just make sure you run the full system scan in Safe Mode. It will ensure you remove Symbiom virus smoother and prevent accidental errors. Log in to your infected account and start the browser. Download Reimage or other legitimate anti-spyware program. Update it before a full system scan and remove malicious files that belong to your ransomware and complete Symbiom removal. When a new window shows up, click Next and select your restore point that is prior the infiltration of Symbiom. After doing that, click Next. Once you restore your system to a previous date, download and scan your computer with Reimage and make sure that Symbiom removal is performed successfully. Guide which is presented above is supposed to help you remove Symbiom from your computer. To recover your encrypted files, we recommend using a detailed guide prepared by 2-spyware.com security experts. How to apply Data Recovery Pro? How shall I use Windows Previous Versions feature? Windows Previous Versions feature is a technique which allows you restore files from their previously saved variants. Here you will learn how the Shadow Explorer works. Keep in mind that this technique will only work if the virus keeps Volume Shadow Copies of your files on the computer. ^ Software cracking. Wikipedia. The free encyclopedia. ^ Peer-to-peer (P2P). Techtarget. Networking information, news and tips. This entry was posted on 2017-07-24 at 04:29 and is filed under Ransomware, Viruses. You can quickly scan the QR code with your mobile device and have Symbiom ransomware virus manual removal instructions right in your pocket. How did you remove Symbiom virus?